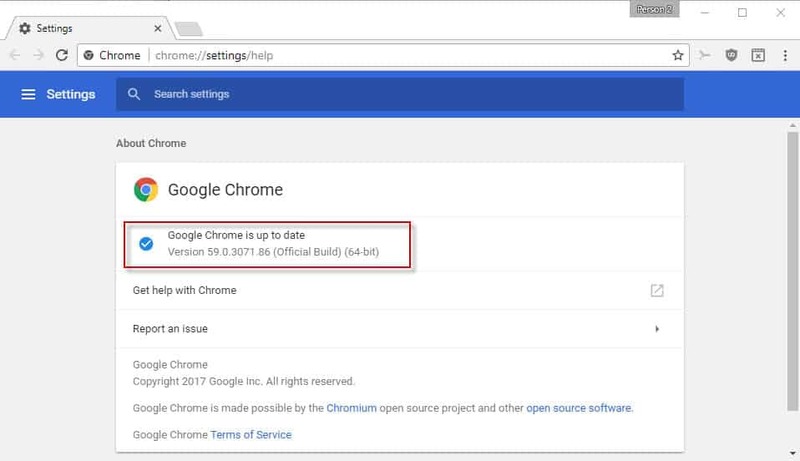 Google released Google Chrome 59 on June 5, 2017 to the Stable channel on all supported operating systems including Windows, Linux and Mac OS X. The new version of Google Chrome ships with 30 security fixes, Settings updated to Material Design, new Developer Tools features, full screenshot capture, and under-the-hood improvements. The official release announcement is -- as usual -- not very forthcoming in regards to the changes of the release. Google highlights the security fixes and Material Design settings, but that is about it. The company states however that blog posts about new features will be published on the official Chrome and Chromium blog, but that has not happened yet. Google rolls out Chrome over a period of time. I never understood why the company does that, as Chrome releases usually include security fixes that all user systems benefit from. Load chrome://settings/help. Chrome lists the current version of the browser on the page. The browser runs a check for updates, and will download and install any new version that is returned. If the check does not work for whatever reason, head over to the official Chrome for Desktop site instead to download Chrome 59 this way. The change that most Chrome 59 Stable users will notice is that Google switched the design of the browser's Settings page to Material Design. Google started to push Material Design changes to Chrome as early as 2015, and has yet to complete the process. The Settings structure may have changed with Appearance settings moved to the top, and the "on startup" setting moved to the bottom. The Material Design version of the Chrome settings uses a slider and no longer checkboxes to toggle options. Tip: Chrome 59 ships with an option to disable Material Design of the Settings page. Load chrome://flags/#enable-md-settings in the web browser, and set the flag to disabled. 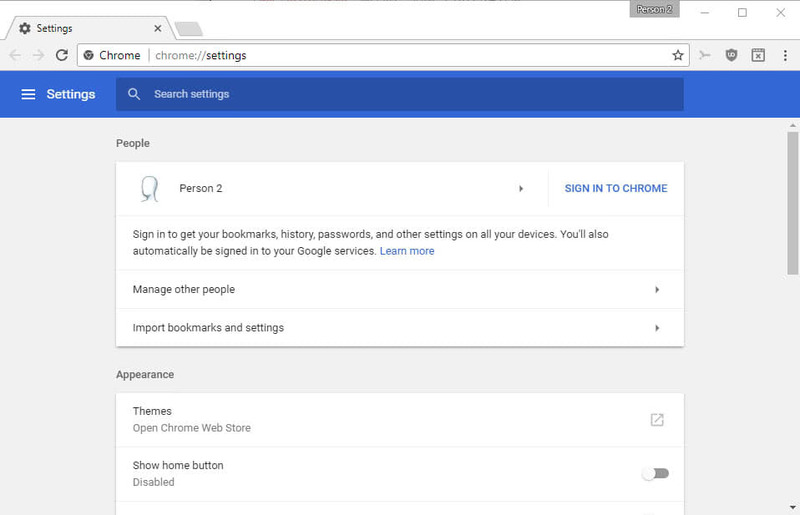 You need to restart Chrome afterwards to get the old Settings design back. This even restores the previous hierarchy of the Settings page. Note that Google will remove the flag eventually from Chrome. The bulk of the changes are under the hood changes that benefit web applications and functionality, but are not directly noticeable by users. Headless Chrome is supported now, but in Chrome 59 only on Linux and Mac. Google promises that it will be enabled on Windows "soon" as well. It allows you to run Chrome in an automated environment that does not display a user interface or peripherals. Mac OS X native notifications. Notifications sent via the Notifications API or chrome.notifications are sent directly by the Mac OS X native notification system in Chrome 59. Service Worker navigation.preload API. Allows the web browser to preload navigation requests "while a service worker is starting up". You can check out the full log of changes of Chrome 59 on the Google Source website. Full Page Screenshots are supported in Chrome 59 now. To make use of the feature, toggle the Device Toolbar with Ctrl-Shift-M while the Developer Tools are open. Click on the menu icon displayed on the toolbar, and select the "Capture Full Size Screenshot" option from the context menu. The Block Request URL feature enables you to block the loading of resources to simulate how the web page behaves when the resource is not loaded. Right-click on any resource that gets loaded on page load and select "block request URL" from the context menu to do so. Step over async wait lets you "step from the first to last line with consistency" in Chrome 59. Unified Command Menu with the Open File Menu. Now You: What's your take on the changes in Chrome 59? Great improvements on W10 specially fonts that are great again. Finally as good as on Android. Did you feel any difference? This is one of my major complaints. Chrome fonts on Windows 10 still looks blurry to me, way worse than Windows 7 was. I’m using the Font Rendering Enhancer extension (https://chrome.google.com/webstore/detail/font-rendering-enhancer/hmbmmdjlcdediglgfcdkhinjdelkiock) just because of that. Or maybe I’m too used to the extension and can’t remember anymore how it was before, hehehe. which is more recently updated and the UI is more useful. This settings page is a mess. Absolutely horrible to navigate. Things that worked in one click now bring you to a separate page. For instance disabling microphone, 3rd party cookies, protected content, etc.. I disabled in chrome://flags everything containing “material” or “md” on my Chromium installation and now I have the old settings page back. Although knowing Google they will remove it completely in the future. Agree with Yuliya – on my MacBook’s Retina screen this Settings page feels like it was made for a kindergartener with chubby fingers! isnt it OK that there is a search box for settings? My problem with the new UI is that toggling five-six-whatever settings is a lot slower than it used to be. I know where they are. Now instead of having a button on the right of the setting string I have to access an individual page then come back, then access another individual page, rinse and repeat for how many settings are there..
you can revert this in “chrome://flags” Set “Enable Material Design settings” to Disabled. I did the same thing. The old chrome pages work perfectly fine, aren’t as slow and the information isn’t nearly as spaced out (thus making it easier and quicker for me to change settings). Making everything material design is unnecessary. It’s a design trend I’ve really grown to dislike. I agree. A terrible redesign, something I’d expect from the idiots at Microsoft. It looks very much like the cancer known as Win 10. On the other hand, it may be intentional: Make Settings so awful, that users don’t bother with it, and accept the defaults. Anybody tried deleting some cookies (not all) from the cookie section of the new setting page? There are hundred (probably thousands) of cookies there. And if you delete one of them, page acts like reloading. Deleting just a cookie takes about 3 seconds. This wasn’t that slow before. They had to create a seperate panel for this job. The cookie section page looks endless in this design. Also you can’t see the amount of data that the sites locally store. You have to click the cookies, and after that again click storage section of the cookies. Before version 59, you can see it directly from the panel without a click. I’m sure you guys all know this already, but the new built-in adblocker for Chrome will essentially not block google ads. Super monopolistic! Another reminder of who google values (and it’s not me and you). I am a game player and every release of Chrome either breaks something or doesn’t fix what’s already broken. In the Facebook game Farm Town, there are now multiple issues and one was from three releases ago. Seems like more emphasis should be placed on fixing the induced bugs than meddling with things like Material Design. Works fine on my machine. What happens when you load the URL?